E_Mail ontvangen van reporter uit Columbus, Ohio. (Columbus Dispatch). My name is Jeb Phillips, and I am a reporter at The Columbus Dispatch newspaper in Columbus, Ohio. 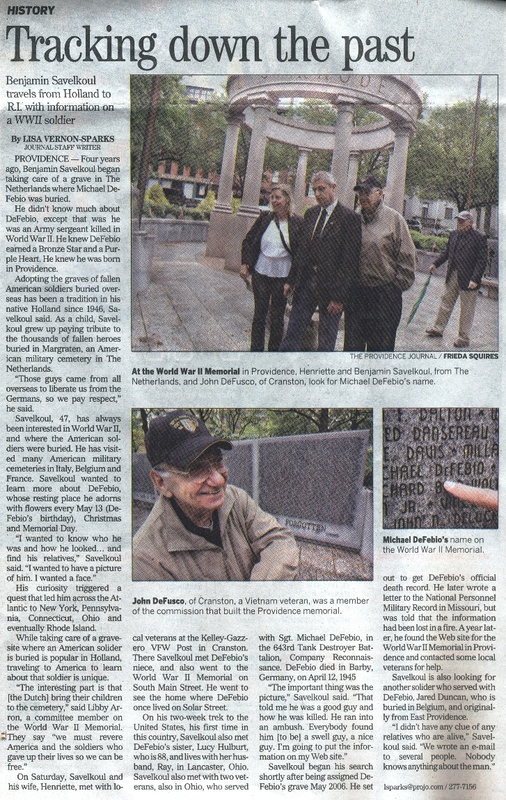 Ray Hurlbut, Michael DeFebio's brother-in-law, emailed my newspaper to tell us about your adoption of Mr. DeFebio's grave. I would like to write a story about that for our November 10 edition (the anniversary of the creation of the cemetery in Margraten). Can I email you some questions about the adoption, or call you to ask you about it? I think our readers would be interested in this, especially since our Veterans Day holiday is November 11. On April 12, 1945, Sgt. Michael De Febio looked out the top of his armored car and was struck by three bullets. He died then and there, as his 643rd Tank Destroyer Battalion rolled through Barby, Germany. He was 26 years old. He had told his mother back in Providence, R.I., that if he were killed, he wanted to be buried near his buddies. And so his body was eventually taken to Margraten, Netherlands, where there was an American military cemetery. It had been established on Nov. 10, 1944, 64 years ago Monday. Angelina De Febio wept when she thought of her son over there with no family to care for his grave, said Ray Hurlbut, 86, Michael De Febio's brother-in-law. Hurlbut's wife, Lucy, is De Febio's only surviving immediate family member. But Lucy doesn't remember things as well as she used to. So her husband of 57 years helped her tell this story, sitting in their home in Lancaster last week. The Hurlbuts moved to Cleveland more than 40 years ago for Ray's job. They have children who live in central Ohio, and they came to Lancaster in 2006 to be near them. 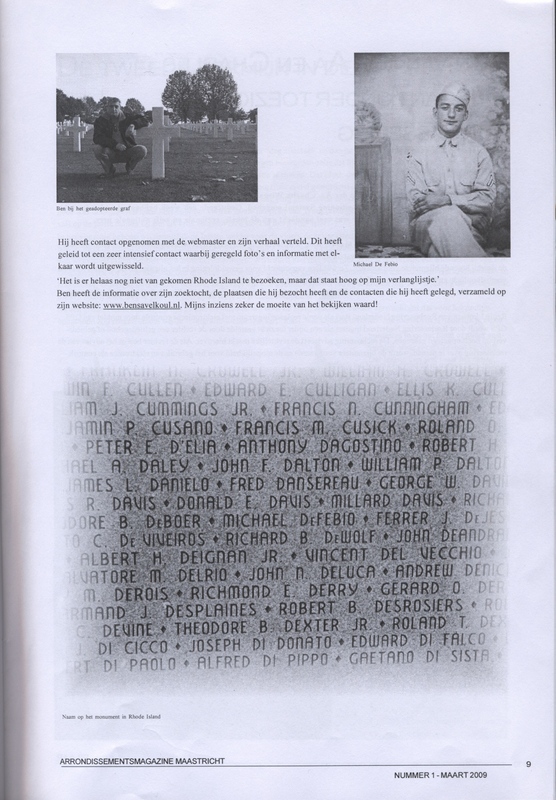 Ray Hurlbut, in fact, is the only family member who has seen De Febio's grave in person. General Electric, his employer, sent him to the Netherlands for a week as part of an information exchange with another company. On Memorial Day 1966, he went to the cemetery in Margraten. "I get there and find his grave site, and there was a little schoolgirl there with a bouquet of flowers," he said. "Almost every grave site I saw had a bouquet of flowers." He learned that the Dutch were taking care of those graves as if their own family members were buried there. As he was leaving the cemetery on a bus, a woman motioned for him to sit next to her. She told him she was 12 years old when the Americans liberated the Netherlands during World War II. "I want to tell you how much we appreciate the Americans in this part of the country," he recalled her saying. De Febio's mother had already died, but Hurlbut came back and told the rest of the family what he had seen. They were relieved, but they still worried. The decades passed. The De Febios began to die off without anyone making it to the grave and without any reports from the Netherlands. Lucy Hurlbut knew only that 40 years ago someone was taking care of her brother's grave. That's it. Until late last year. The Hurlbuts got a call from a man named John DeFusco in Rhode Island. 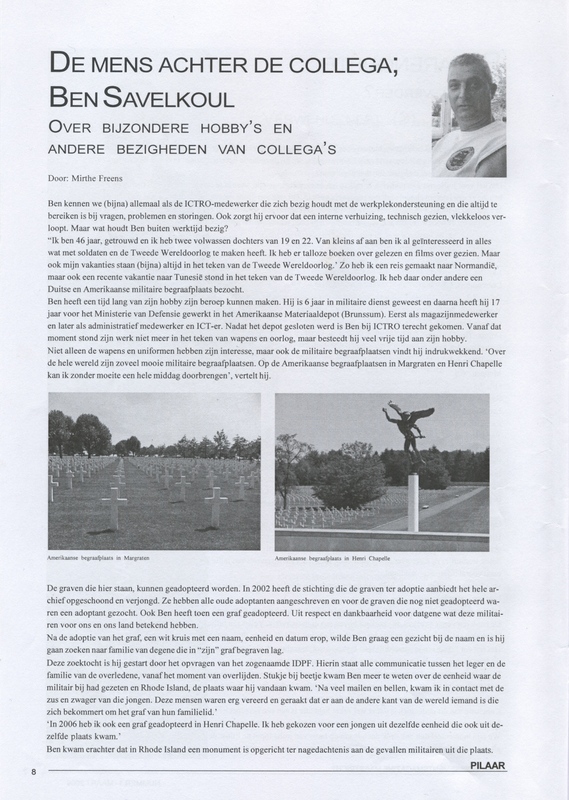 He was involved in the fundraising effort for a World War II monument in Rhode Island and had just received an e-mail from the Netherlands. The e-mailer's name was Ben Savelkoul, and he had adopted the grave of a man named Michael De Febio of Rhode Island. He had found DeFusco's name online. Could he or anyone else help him find De Febio's family members? DeFusco went to the phone book and found one De Febio - the widow of another of Lucy's brothers. She led him to the Hurlbuts in Lancaster. 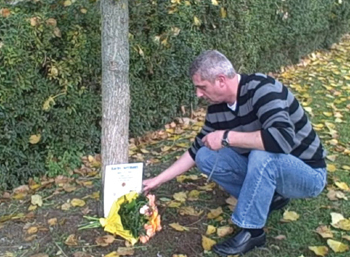 Ray thought it could be a scam, but with research he learned about a program that allows Dutch residents to adopt those graves. Each of the 8,301 graves are being tended. Savelkoul is 46, born after World War II. He works at the courthouse in a nearby city. He asked the Association for Adopting Graves at the American Cemetery in Margraten if he could adopt a grave, and it assigned him De Febio's. He tries to visit at least every two months. He makes a point of visiting on important days: Christmas, and De Febio's birthday on May 13, the day he was killed. "I am thankfully to these men who liberated us and gave their lives for our freedom," he wrote to The Dispatch in response to e-mailed questions, after saying he was trying to use his best English. "The least thing we can do is remember them and praise them." Lucy Hurlbut started crying when she found out. "It's good to know that's happening to those guys over there," said her husband, who is also a World War II veteran. "I can't explain how thrilled I am," said DeFusco, the man in Rhode Island. He's a Vietnam veteran. Savelkoul sends the Hurlbuts pictures of the grave from time to time, and he has placed flowers there for them. He has set up a Web site, www.bensavelkoul.nl, where visitors can learn about De Febio and his unit. The Hurlbuts go to the Website, too, of course. More than six decades after Michael De Febio died, they can be sure that someone is looking after him.